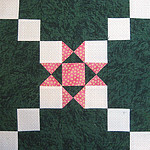 When I made this month’s block for the Sneak Peek I was afraid that, though it looked fine, it wouldn’t “measure up”. Literally – that it wouldn’t be the right size. I got brave and measured my block today and found that it does measure up, so I won’t be embarrassed to send it to some lucky winner.